One of the most common reasons that patients have for avoiding the dentist is fear or anxiety. Sometimes these feelings of anxiety are rooted in the past. Other times, patients experience them because they have a sensitive gag reflex, or they have trouble sitting or holding their mouth open for a long period of time. All of this often results in appointments being put off or avoided completely. But when you don’t visit the dentist regularly because of dental anxiety, your oral health suffers. Over time, this kind of neglect can lead to tooth loss, disease, and health problems in other parts of your body. Still, we understand that your fears are very real, and we want to help you address them and even overcome them. You deserve dental care that considers your emotional as well as physical needs. 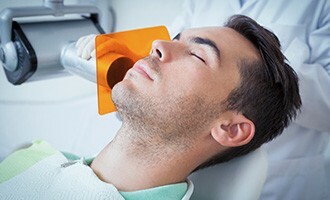 With sedation dentistry, team at South Shore Dental Care can help you feel more relaxed during any dental procedure, from a simple filling to a complex root canal. Different offices meet the sedation needs of their patients in different ways. Our Massapequa team uses oral sedation to put dental phobias to rest. Using oral sedation, we can help patients with varying degrees of fear experience a degree of comfort than they ever thought possible. If you’re nervous about going to the dentist, simply let us know so we can discuss the use of oral sedation. Once we know if you’re a good candidate for oral sedation—which we’ll do by reviewing your medical history and your current medications—we’ll select an anti-anxiety prescription or sedative drug that fits your needs the best. No matter what we choose, we’ll be selecting from a range of safe, widely-prescribed drugs designed to diminish anxiety. The dosage you’ll be prescribed will depend on the amount of anxiety you feel, and this will determine your level of consciousness during your appointment. It’s not uncommon for patients to feel so relaxed during their appointment that they actually drift off. 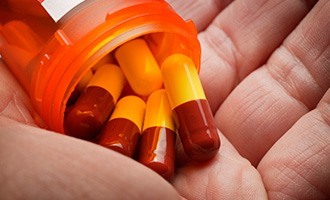 On the day of your appointment, you’ll just need to take your sedative or anti-anxiety pill as prescribed. Sometimes, patients are encouraged to take part of their prescription the night before so they sleep better prior to their procedure, but that will depend on your specific needs and isn’t necessary for everyone. Once you’ve taken your pill, you’ll need to have a friend or family member drive you to and from your appointment and stay with you until the effects of your sedation have worn off. But what if oral sedation isn’t right for you? Our Massapequa team also offers nitrous oxide sedation for greater patient comfort and relaxation. Some patients may even benefit from combining nitrous oxide and oral sedation. For our patients who experience the most extreme dental fear, we can also use a method called IV sedation. For this, a strong sedative will be put directly into the bloodstream via a painless injection. It’s potent, fast acting, and your sedation level can even be adjusted throughout your procedure as needed. Sedation dentistry has helped thousands of patients who formerly avoided dental care discover a renewed sense of hope for their oral health. If dental anxiety has kept you from visiting our Massapequa dental office, sedation dentistry can help you, too. To learn more about how we can give you the most stress-free dental experience ever, please contact us today.